Volbeat is a well known Danish heavy metal band formed in Copenhagen. They play a fusion of rock and roll, heavy metal, punk and rockabilly. Volbeat are sick and tired of music purists wagging their finger at them. They refuse to be confined to the pigeonhole of a specific genre but throw off all fetters intended to keep them on the ground. In the past four years, this thoroughly honest attitude has made the four musicians from Denmark one of the hottest acts on the rock scene. Sold-out venues everywhere, celebrated festival appearances at the Rock am Ring festival, during the Sonisphere Festival Tour, and opening for Metallica and AC/DC – and now they’re about to release their latest album “Beyond Hell/Above Heaven”. 13 September will see the arrival of the 13-track recording, and as they did on their previous four releases, the band has succeeded again in combing the sound of the Fifties with that metal flair. If you were to draw a picture of Volbeat’s sound, it would feature Johnny Cash, Elvis Presley and Metallica – all of them peacefully united, cool drink in hand. “Beyond Hell/Above Heaven” is a perfect mix of heavy riffs, country coolness and rockabilly hip swing. The result makes not only the heart of a headbanger, but also that of a quiff wearer beat faster. Fans of anthemnic oeuvres are likely to press the Repeat button to listen to “Fallen” again, those more into quiet sounds will love “Heaven Nor Hell”, while up-tempo buffs will get down to business listening to “A Warrior's Call”. To cut a long story short: Volbeat have refined their highly original mix of passionate riffs and haunting melodies even more, getting straight to the point. Mind you, the band has pursued the idea of transporting the values and achievements of the Fifties into our times ever since the beginning of their career. Band mastermind Michael Poulsen may have been a member of death metal act Dominus, but has concentrated on Volbeat since 2001. The group’s success speaks for itself: their 2005 debut “The Strength/The Sound/The Songs” was still considered an insider tip, but the breakthrough arrived in 2007 with “Rock The Rebel/Metal The Devil”. The music press was delighted, showering the band with top marks. In addition, the quartet made the top of the Danish charts, even garnering a platinum award in their native country. This fact did not remain hidden from the giants of the rock industry. When Metallica were looking for an act to open their 2007 gig in Aarhus, they opted – at James Hetfield’s request – for Volbeat! This kick-started the band’s career – one tour followed the other, the venues becoming bigger and bigger. 2008 was marked by a brief break from the live circuit while the band recorded their third album “Guitar Gangsters & Cadillac Blood” at Jacob Hansen’s. The album arrived at the stores in September, making the top position of the Danish and Finnish charts. “Guitar Gangsters & Cadillac Blood” climbed to no. 15 in Germany, and Volbeat embarked on another triumphal march, with tens of thousands of music fans going wild at the Rock am Ring and Wacken:Open:Air festivals as Poulsen & Co. performed hits such as “Sad Man's Tongue”, “Mr. & Mrs. Ness” and “Mary Ann's Place”. Volbeat are set to repeat this feat in autumn 2010, performing their latest anthems live all over Europe. Among the highlights are numbers such as the highly emotional “Fallen”, which Michael Poulsen has devoted to his recently deceased father and irresistible tracks such as “Evelyn” (featuring Napalm Death’s Barney Greenway on vocals) and “7 Shots” with Mille Petrozza (Kreator) and Michael Denner (Mercyful Fate) on guitars. This extremely well-balanced, highly exciting mix of uncompromising relentlessness and ever-present melodies makes “Beyond Hell/Above Heaven” a top-quality rock gem: dazzling, rare and infinitely valuable. The Strength/ The Sound/ The Songs won the award for the best debut album at the Danish Metal Music Awards 2005. Volbeat won the award Steppeulven for hope of the year 2006. 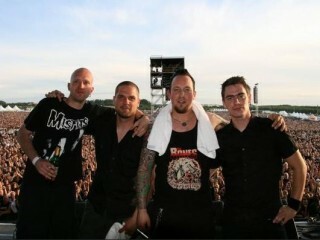 Volbeat won the award for the best live band at the Danish Metal Music Awards 2006 voted by fans. Rock the Rebel/ Metal the Devil won the award for best album at the Danish Metal Music Awards 2007. Volbeat won the Danish radio award for P3 listener hit at the P3 Guld-show voted by listeners of P3.